QUEBEC - A former minister in Jean Charest's Quebec cabinet has been slapped with three criminal charges in the latest ethics embarrassment to befall the provincial government. Tony Tomassi faces charges of fraud and breach of trust. They stem from accusations that he accepted material rewards from a company that had received government money. 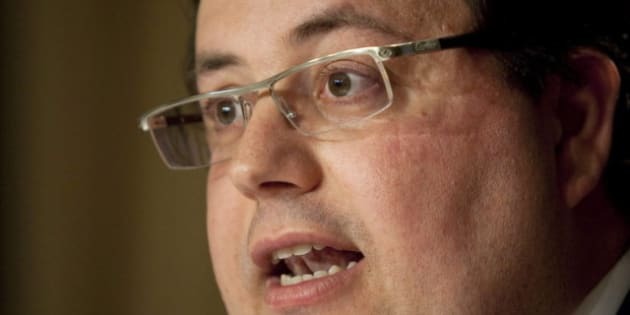 The Montreal-area legislator was the most scandal-prone minister in Charest's scandal-plagued government. Last year, he was forced to resign amid accusations that he had been using a credit card supplied to him by a private security company — a company that had received millions in government grants. In the weeks before his departure, Tomassi had also been battered with allegations of cronyism in the awarding of contracts for public day-care permits. He was the minister of families, responsible for running Quebec's iconic $7-a-day public day-care system. Tomassi must now appear in court in Quebec City on Nov. 14. Before that, he must appear at provincial police headquarters in Montreal to have his fingerprints taken. Police offered a strong hint that he might not be the only person charged in the case. "The investigation is ongoing and it is not impossible that other people will face justice," said a statement from Robert Lafreniere, head of the provincial anti-corruption unit. "We will not offer any further comment to avoid undermining either our investigation or the current judicial process." The head of the anti-corruption unit had hinted last week that someone might be facing charges. Meanwhile, Charest was out of the country Tuesday on a 10-day European trip and was not immediately available for comment. His public-security minister also declined to comment, stressing that he did not want to interfere with an independent investigation. The Charest government has been under intense pressure to call a public inquiry into political corruption. He has repeatedly resisted that pressure and, instead, pointed to other measures he's taken — like introducing new rules for political fundraising and public contracts, in addition to creating an anti-corruption unit. The opposition expressed little surprise at the news and continued to demand an inquiry. The Parti Quebecois, in fact, suggested that the ongoing police investigations had hardly yielded results. "If it took 18 months to investigate a credit card I'm wondering how long it will take to shed light on the infiltration of organized crime into the construction industry," said PQ critic Stephane Bergeron. The charges against Tomassi stemmed from the work of that same unit, which comprises a police squad nicknamed Operation Hammer. Tomassi is accused of using, from Nov. 1 2007 to May 6, 2010, a credit card supplied by the now-bankrupt Canadian Bureau of Investigations. Better known as BCIA, the firm had received a $4-million grant from the Quebec government before it declared bankruptcy. At the time, Charest called the accusation serious and said he had forced Tomassi to tender his resignation. "These are troubling facts that raise questions," Charest said last year. "As premier of Quebec and head of the government, I cannot accept a situation like that."